The rally from the air. Photo by Lu Tong-hi. CC: NC. 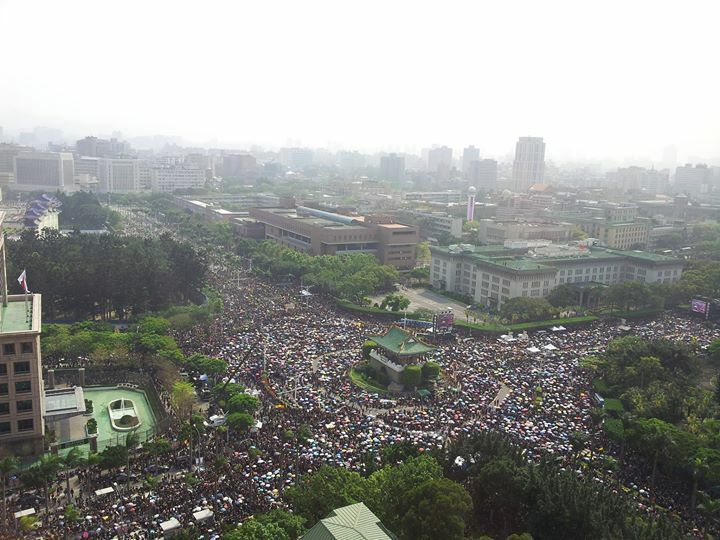 On Sunday March 30, 2014, about 500,000 Taiwanese from all over Taiwan joined a public assembly in Ketagalan Boulevard in Taipei to support the protestors  who are occupying the country's legislature, known as the Legislative Yuan, in protest of the secret negotiations surrounding the Cross-Straight Service and Trade Agreement (CSSTA) with China. 4. Legislators from both parties should step out and address the people’s demands for the creation of a monitoring mechanism for cross-strait agreements as soon as possible. They also asked their supporters to come to the Legislation Yuan every day to support the occupation and pressed the legislators to respond to these requests. A young child at the rally. Photo by sheina0128. CC: NC. The occupation protest has won not only domestic support from 45 cities and 16 counties , but also overseas support from Hong Kong , and activists from mainland China, such as Hu Jia , also expressed his support on March 30  through Twitter. It is 1 p.m. I joined the rally [in Ketagalan Boulevard, Taipei] by myself as I am detained at home in Beijing. 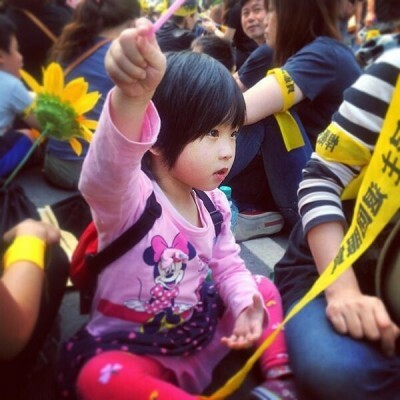 To my friends in Taipei who have joined the Sunflower Movement: there is someone in Beijing supporting you. Beijing is not absent in this rally.